Wi-Fi can be found anywhere nowadays, and the best Wi-Fi is free Wi-Fi. Just be careful of the dark corners of free public Wi-Fi. There's no such thing as free lunch, remember! We've collected tips and tricks to help you stay connected safely. 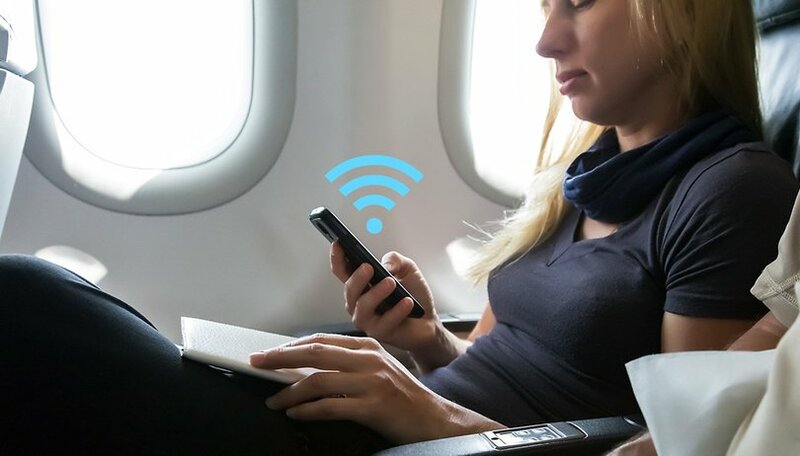 Here's how to find Wi-Fi while on the go. Your Android will already tell you if a Wi-Fi connection is secured or not. Just go to Settings > Wi-Fi and look for connections that are labeled 'open' or 'unsecured' and connect. Failing that, a connection to a secured network is just a password away. You can look around public spaces, like cafes, for passwords to be posted, or ask a neighbor if you can use their Wi-Fi network for a bit. The important thing is to remember to use your scanner and keep your eyes peeled. Open the Facebook app, which you're sure to have already downloaded, tap the More tab and open up "Find WiFi" with your iPhone or Android device. This feature will help you find nearby sources of free, public Wi-Fi. Choose from a list of businesses in your area, and see the opening hours alongside the network names. Not all businesses have opted-in to have their networks listed yet, but the Facebook Find WiFi feature is very useful already. If you live near a library or take your lunch near one, you can always pick up free Wi-Fi for a limited time at the good old book depository. Again, you may need to stroll in and grab a slip of paper, but sometimes the Wi-Fi password is written up on the wall for all to see and use. Some of the big cable networks also provide Wi-Fi access a freebie in their subscription deals. Take a look at your fine print or call customer service to find out if you have any data access included in your subscription. This is not technically free, but if you never knew you had access to hotspots across the city, it's the next best thing. It doesn't take a genius to know that certain major chains use free Wi-Fi as a carrot to entice customers in. Just as the free restrooms at McDonalds cause plenty of people to swing by in times of need and stick around for some fries, so too does free Wi-Fi. It almost makes up for paying six bucks for a Starbucks coffee. Instabridge is a great little app where crowd-sourced Wi-Fi connections and passwords are compiled into a network of millions. The best thing is that it also includes secured connections, so as long as one person paid for that overpriced latte, everyone with the app can enjoy the connection. WeFi is a great app that automatically connects you to any free Wi-Fi in your area, based on the combined resources of millions of users just like you, who know that where there are numbers, there's strength. With over seven million downloads and hundreds of millions of hotspots, WeFi is sure to have coverage right where you are. Before you find a free Wi-Fi network and jump right in, there are a few things you should consider. The truth is, like all things in life, nobody gives you something without expecting something in return. Free Wi-Fi spots can be an absolute playground for those who want to hack and steal. You never really know how secure a good the standard encryption protocols are of a network that anyone can join for free. Men-in-the-Middle attacks, where hackers can listen in on the data moving between the network and a connected device, can happen. There are also Fake Hotspots to worry about. this is where a hacker will create what looks like a free Wi-Fi hotspot to encourage users to join. Once connected, the malicious creator can hit your hardware with malware or even take control of your device to steal personal information. If you are ever worried about the authenticity of a network in a bar or cafe, ask a member of staff to confirm the Wi-Fi network is operated by the establishment before connecting. How do you get free Wi-Fi? What do you do when there is no Wi-Fi? Tell us in the comments. Thanks for the info. The last 2 Apps make this article more useful. Here in Toronto along with libraries, the subway stations recently installed wifi - mobile data coming "some day". The local Starbucks wifi carries outside the store. I've been able to use it from a nearby park bench without purchase. Bell Canada telco has wifi arrangements for subscribers with several coffee shop chains, no purchase needed. The last time I was in London there was free Wi-Fi on the tube but only at the stations. Just enough time to refresh your Twitter feed before moving off into the darkness again. I use Facebook "Find Wifi", but I try the others alternatives too. Also, reviewing readers comments.... "thank you for the helpful information"..... I hope they realized that they've been misled. A gentleman in Florida was hit with a felony charge for that sole action. Kris.... Why are you encouraging your readers to conduct an illegal activity? Accessing non-owned unsecured wifi points in a number of states is against the law. Ow! Can i apply this features in any country? Or you can find a bestfreewifi.com hotspot anywhere! I see a lot of comments of people , like they have been using Internet and computers from 2 weeks ! - Dilettantes !!! We fi unable to connect to WI-FI which is password protected. Hi Anshul, you may use a wifi certified passpoint. It would also address security issues. You may read Hotspot shield blog for more info about its benefits. Any article that opens up with premises such as avoiding visiting a friend because he doesn't have Wi-Fi in his home, or not stopping in a cafe simply because they don't offer free Wi-Fi to their patrons is an utter crock! Seriously, get a life. Your criteria for friendship are warped and your basis for deciding where to spend your money are nothing more than superficial at best. IT IS VERY HARD TO USE IN TRUCKING WORK . Most European countries have Internet Data Plans ! - Don't skimp on this. Stop relying on Wi-Fi , just buy 4 G Internet Data plan (it's only 10- 20 dollars US a month , up to 36 GB monthly data usage). Problem solved !